How can you help clients with low back pain? People often seek out Pilates because of recurring or chronic low back pain. Many clients try Pilates because someone told them it would be “good for your back”, or because they want to “work on core strengthening” and “improve posture” hoping that it will help their pain. Low back pain is pain experienced anywhere below the level of the ribs and above the level of the gluteal folds, and it may be accompanied by pain radiating down the leg. Low back pain is most common in people 25 to 64 years old – a prime age group for Pilates clients. About 90% of cases of low back pain are “non-specific”, meaning that there is no suspected pathological cause. Less than 2% of people with low back pain have a serious spine condition that requires medical intervention or surgery, but when in doubt, refer your client for assessment by a health care professional like a physiotherapist. Though most episodes of low back pain will settle in a couple of weeks, the bad news is that low back pain is very common. Somewhere between 60 to 85% of people will experience one episode of low back pain in their lifetimes. Also bad news: low back pain often becomes a recurring issue. Anywhere from 25 to 80% of people who have an episode of back pain will have another episode within one year, and over 75% will have recurrence in their lifetime. The good news is that exercise can help non-specific low back pain, so it can help most people! Pilates, physiotherapy, and other therapeutic exercise can help low back pain, and physical activities like walking, riding a stationary bike, or yoga may also be helpful. Your client with low back pain is very likely to experience multiple episodes of back pain over time. Helping your client to find positions and exercises that “work” and educating them on how they can use these in their everyday lives can be a valuable part of your Pilates sessions. We were able to practice squatting “out of gravity” by performing footwork on the Reformer, and then added a sit fit under her pelvis to provide additional feedback on her lumbopelvic alignment. We practiced the same motion by doing frog using the springboard/Cadillac leg springs and frog on the Reformer with feet in straps (you could also try this supine using Theraband around feet). We also practiced a squat motion maintaining neutral lumbopelvic alignment with seated footwork on the Wunda chair, standing squats holding the ends of a Theraband, standing squats using the springboard/Cadillac arm springs, and squats holding weighted balls. We also tried squatting down to hover above a chair, and seated bouncing on a stability ball. 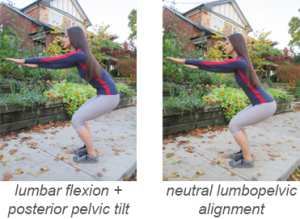 During all these exercises we were able to use back pain as an indicator of whether her alignment was neutral – if it hurt, it was immediate feedback that she was “rounding her low back” and “tucking her tailbone”. Chronic low back pain is pain that has lasted greater than 3 months. The brain has a lot to do with chronic pain, and persistent pain is NOT an indicator of ongoing tissue injury – in chronic pain, hurt does NOT equal harm. The relationship between pain and pathologies seen on scans (e.g. X-ray or MRI) is weak. Many people who have low back pain have normal scans, and somewhere between 20 to 60% of people with NO low back pain symptoms DO show disc herniations or spinal stenosis on MRI. Exercise can help low back pain, and it does NOT have to target spine movement or core strength to be helpful. Think of movement as helping to “reset” the nervous system more than “fixing” an anatomical or biomechanical cause of pain. Clients with chronic low back pain may be hesitant to move their spine, as based on their past experiences, they expect it to hurt! Particularly during your initial sessions with a client who has low back pain, you may want to try working somewhere other than the area of pain. You don’t have to directly target spinal motions, abdominal muscles, or back muscles in order to help. As a starting point, you could try exercises that mobilize hips or mobilize shoulders, or you could try a few exercises from the postural control series. Proceed gently and gradually, and let feedback from your client guide you. Like in the recurrent pain example above, movements in your Pilates sessions can help your client find improved biomechanics for everyday activities, especially for everyday movements that aggravate their pain. Want to know more about working with clients who have pain? Check out the upcoming Pain 101 workshop for more about the role of the brain in pain, “red flags” that indicate you should refer your client to a health care professional, and strategies for working with clients who have pain. Elizabeth Crawford, M.Sc. (PT), MA, BPHE, is a registered physiotherapist with the College of Physiotherapists of Ontario. In addition to her Physiotherapy education, Elizabeth has university degrees in Physical/Health Education and Kinesiology, and has taken additional courses in Myofascial Release, Neuroproprioceptive Taping, and Neurodevelopmental Treatment. She is also a Body Harmonics Pilates & Movement teacher, so her approach to treatment is focused on functional movement and whole body integration.